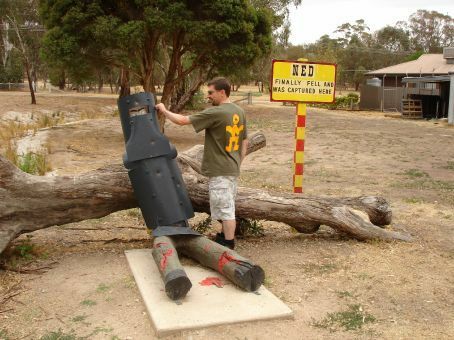 Check out our hard hitting Documentary about Ned Kelly's last stand in Glenrowan, Victoria. I have to say I was extremely disappointed with Glenrowan - I guess I was expecting something a bit more impressive considering the towns history with the rather famous Kelly Gang - especially considering it is the towns only real claim to fame. Several telegraph-pole stumps with childishly painted faces on them are scattered randomly around the area of "Siege St", with no labels or other information highlighting who/where/what they are supposed to mean. The only stump-figure with any labeling is the one supposedly marking where poor Ned fell wounded after being shot in the leg & being unable to stand again with all that ridiculously heavy home-made armour on. 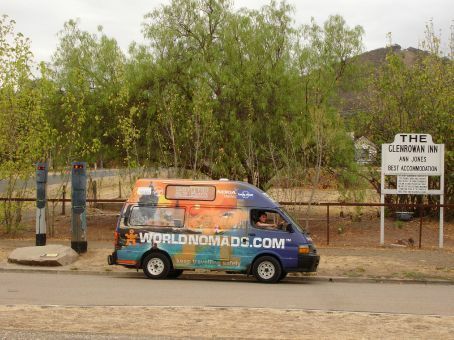 The pic below shows the location where the Glenrowan inn once was, with some more stump-men who are possibly meant to be other members of the Kelly gang. The modern houses directly behind & right next door (cropped out of camera shot as they are that close) are both for sale if you want to buy into a historic location. 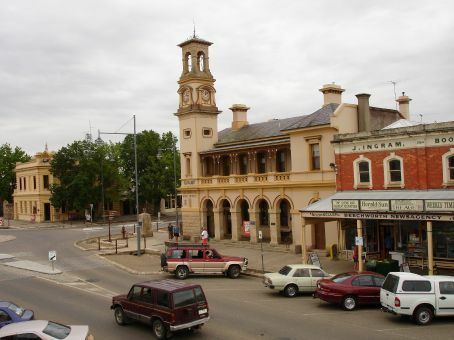 In stark contrast, we spent the previous two days in Beechworth, which is a very pretty town, full of wonderful historic buildings which are well preserved & displayed. 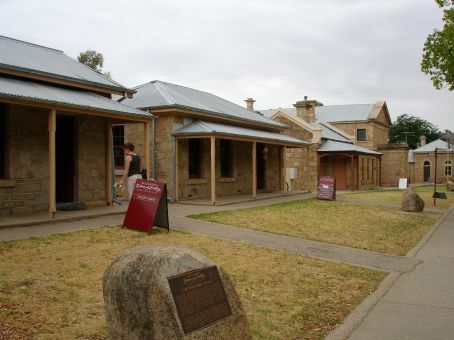 It has far more authentic Kelly gang displays such as the courthouse where Ned Kelly was imprisoned & tried, and the Bourke museum which contains many Kelly gang artifacts. The town is also full of enticing antique stores & galleries and has worked hard to keep to it's original style, a walk down the main st is like stepping back in time. With an old style chocolate shop, bakeries, milk bars & pubs with sweeping verandahs, we could have easily spent another day or two staying there. A place not to be missed in our opinion. Find Beechworth and Glenrowan on google maps. Love the doco. There's a definite future there. G'day,<br>maybe you need to read up a bit more about the story.<br>However I can understand what you mean, they need to do a lot more to explain what happened where. Forget the Ned made out of logs, that is not what it is all about. <br>Dave.